Two years after the failure of Senate legislation to expand background checks on gun purchases, the public continues to overwhelmingly support making private gun sales and sales at gun shows subject to background checks. Currently, 85% of Americans – including large majorities of Democrats (88%) and Republicans (79%) – favor expanded background checks, little changed from May 2013 (81%). The latest Pew Research Center poll of 2,002 adults, conducted July 14-20, finds that opinions about other gun policy proposals also are largely unchanged from two years ago, shortly after the December 2012 school shootings in Newtown, Conn. Almost identical shares of Republicans (81%) and Democrats (79%) support laws to prevent the mentally ill from buying guns. 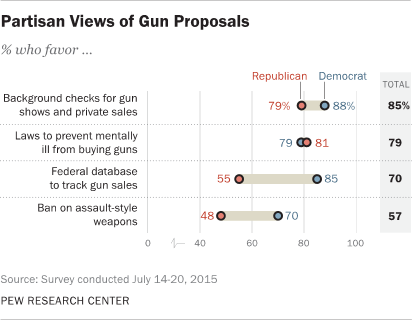 But other proposals are more divisive: 85% of Democrats favor creation of a database for the federal government to track gun sales, compared with 55% of Republicans. And while 70% of Democrats back an assault-weapons ban, only about half of Republicans (48%) favor this proposal. Since December 2014, when support for gun rights reached a two-decade high, the share prioritizing gun rights has fallen five percentage points, while the percentage saying it is more important to control gun ownership has increased four points. There continues to be a substantial partisan gap in opinions about whether it is more important to control gun ownership or protect gun rights – much larger, in fact, than the gap over specific gun proposals. Nearly three-quarters of Democrats (73%) say it is more important to control gun ownership; 71% of Republicans say it is more important to protect gun rights. As previous Pew Research Center surveys have found, there is broad support for expanded background checks even from those who say it is more important to protect gun rights than to control gun ownership. 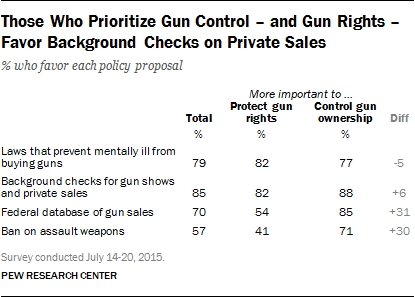 About eight-in-ten (82%) of those who say it is more important to protect gun rights favor expanded background checks on private gun sales, as do 88% of those who prioritize controlling gun ownership. Similarly, support for laws preventing the mentally ill from buying guns draw comparable levels of support from those who prioritize protecting gun rights (82%) and those who say it is more important to control gun ownership (77%). However, those who say it is more important to control gun ownership are 31 percentage points more likely than those who prioritize gun rights to favor a government database to track gun sales (85% v s. 54%), and 30 points more likely to support an assault weapons (71% vs. 41%). The survey finds that overall public views of the political influence of the National Rifle Association (NRA) have not changed much in recent years. But they have become more politically and ideologically polarized. Currently, 40% say the NRA has too much influence over gun control laws in this country, 17% say it has too little influence, while 36% say it has the right amount of influence. This balance of opinion is virtually unchanged from May 2013. In fact, it is also comparable to opinion about the NRA’s influence in 2000. However, there are wider differences in how conservative Republicans and liberal Democrats see the NRA’s influence. Among Republicans and Republican leaners, just 13% of conservatives say the NRA has too much influence, down from 32% in 2000. By contrast, 68% of liberal Democrats and Democratic leaners say the organization has too much influence, compared with 57% who said this in 2000. Support for expanded background checks and laws preventing the mentally ill from buying guns spans all partisan and demographic groups. In addition, both proposals are favored by majorities of those in households that have guns and those that do not. There are wider demographic differences over the creation of a federal database for gun sales and banning assault weapons. While 66% of whites favor a federal database to track gun sales, this proposal draws more support from blacks (82%) and Hispanics (76%). Support for an assault weapons ban varies by gender and education, as well as by gun ownership and community type. 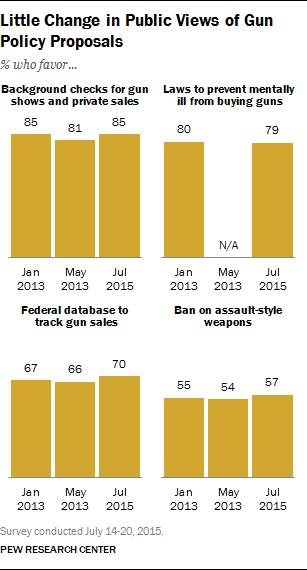 Nearly two-thirds of women (65%) favor banning assault weapons compared with 48% of men. Those with post-graduate degrees are among the most likely groups to favor a ban on these weapons (72%), while only about half of those with a high school degree or less education favor such a ban (48%). Nearly two-thirds (64%) of those who live in households with no guns favor a ban on assault weapons, compared with 49% in gun-owning households. Currently, 50% of Americans say it is more important to control gun ownership, while 47% say it is more important to protect the right of Americans to own guns. 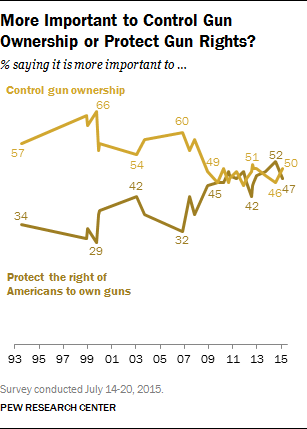 That represents a shift since December 2014, when more prioritized protecting gun rights (52%) than controlling gun ownership (46%). The issue remains a highly partisan one. Republicans choose gun rights over gun control by a 71% to 26% margin, while Democrats prioritize gun control over gun rights by a 73% to 25% margin. Guns also continue to divide the public along racial and gender lines. Whites say it is more import to protect gun rights, by 57% to 40%. Majorities of Hispanics (75%) and blacks (72%) say it is more important to control gun ownership. By nearly a two-to-one margin (63% to 32%), adults with post-graduate degrees say it is more important to control gun ownership than protect gun rights. A majority of college graduates (54%) prioritizes gun control, while 42% prioritize gun rights. Those with less education are divided (51% protect gun rights, 47% control gun ownership). Among people who live in urban areas, 60% say it is more important to control gun ownership, compared with 38% who prioritize gun rights. Opinion among suburban residents is divided (48% gun control, 48% gun rights), while a majority (63%) who live in rural areas prioritize gun rights. 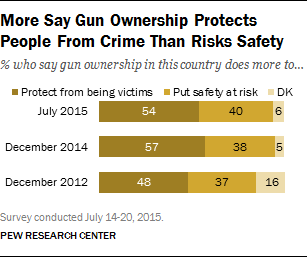 A majority of Americans (54%) say that gun ownership in this country does more to protect people from becoming victims of crime, while 40% say it does more to put people’s safety at risk. These findings are largely unchanged from December, when a 57% majority said owning guns does more to protect people from crime. Whites, by 60% to 35%, say gun ownership does more to protect people from crime than to put their personal safety at risk. Blacks by a similar margin (56% to 37%) say that gun ownership does more to endanger people’s personal safety. While opinion among whites has changed little since December, more blacks now say gun ownership puts people’s safety at risk (41% then, 56% today). Attitudes among African Americans today are closer to those in December 2012, when 53% said guns create a safety risk and just 29% said guns do more to protect people from crime. There also are gender, partisan and education differences in these opinions. Six-in-ten (60%) men say gun ownership does more to protect people than endanger safety, compared with 49% of women. Republicans are about twice as likely as Democrats to view gun ownership as doing more to protect people than place their safety at risk (74% of Republicans vs. 36% of Democrats). Adults with post-graduate degrees are the only educational category in which a majority (57%) says gun ownership does more to put people’s safety at risk than to protect people from becoming crime victims. College graduates are divided (48% say they do more to put safety at risk, 46% to protect people from crime), while a majority (59%) of those with less education says gun ownership does more to protect people.